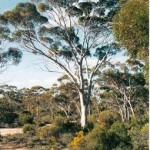 The most widespread tree in the Wheatbelt, it is also one of the most majestic. 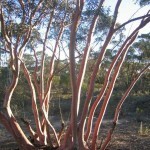 It was named by the first settlers due to the colour of its smooth bark. Known to be an indicator of good heavy soil, the salmon gum open woodland was extensively cleared in the early days. Growing up to 25 metres, the salmon gum is virtually the largest of the wheatbelt eucalypts but has one of the smallest fruits. It has fine dense grained timber that is now used for flooring and panelling. This medium sized eucalypt up to metres, has a very attractive fluted, copper or khaki coloured trunk. It is very frost resistant and salt tolerant and is grown throughout the world. It preference for rich loamy soils resulted in large stands being cleared for farming. 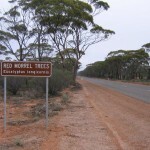 Morrel’s grow up to 25 metres are also a tall tree of the Wheatbelt woodlands favouring loamy soils. They are distinguished by the rough bark over most of the tree giving it a somber appearance compared to the Gimlet and Salmon Gum. Small glossy green leaves, distinctive buds and fruit. Mallee the name of trees that develop underground lignotuber, are multi-stemmed, and resprout from this lignotuber at ground level after fire or wind damage. 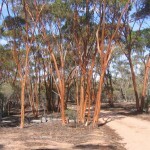 They commonly occur as mallee thickets on sandy loam or as shrubs in heathland. Mallees – such as the beautiful Eucalyptus erythronema (Red-flowered mallee) produce massive clusters of nectar filled flowers that attract insects, pygmy possums and birds such as honeyeaters and parrots. Beautifully smooth olive-green, golden bronze bark, lignotuber, multi-stemmed often found in association with Acacia acuminata (Jam tree). This mallee has very tough wood and is a good nectar producer. Usually grows in loamy soils, along roadverges, small creeklines, and around granite outcrops eg Merredin Dam carpark. Flowers: White. Late Spring and Summer. A medium sized tree to 12mts tall or Mallee to 8mts. Sheds its bark rich in tannins in autumn to expose a white to orangey cream trunk that is not as smooth as the salmon gum or gimlet. If undisturbed the bark litter at the base can accumulate to a considerable depth and is a favoured habitat of some orchid species that make use of the increased runoff from the trunk and the moist conditions. Flowers: creamy white. Summer and Autumn. 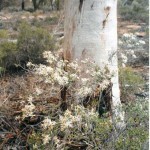 Mallee to 9mts tall with smooth white bark and a dark green crown. It has clusters of flowers with pendulous urn shaped fruits. The town of Merredin is supposedly named after these mallees then just referred to as (Merrit) by the Aboriginal people. 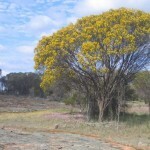 The tree form of this wattle is one of the tallest wattle species in the area. Commonly found on loamy soils, often in the vicinity of granite outcrops and in association with York Gum and Allocasuarina sp. Sheoak. The under-story is often native grasses and everlastings. 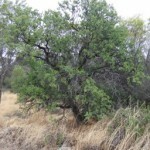 There is also a scrub form of the jam tree found on poorer soils. Freshly cut it smells like raspberry jam- hence the common name. The timber is rich brown colour with a yellow core, it’s hard and durable and often used for decorative wood turning. It was a common component of fencing in the early days as jam posts were resistant to white ants. Flowers: covered in yellow rod shaped blossoms. Winter to late Spring. The fragrant timber of this tree gave it a great ecomomic importance in the early days of settlement. Sandalwood cutters were some of the first pioneers into many parts of the Wheatbelt. The tree rarely has a tidy appearance unlike its near relation the Santalum acuminatum (Quandong). An easy way to distinguish the two trees is by their dupes (stone fruit). The sandalwood dupe is brown and under the flesh the stone is smooth and oily. The Quandong dupe has a pitted stone with bright red flesh when ripe. Both trees are parasitic and require host plants, often Acacia sp. to develop.